Move forward with the CAT Preschool Lightning Load. Features motorised driving action and lights and sounds with the CAT Dump Truck or Cement Mixer and see the dramatic light up dump bed or cement drum “lightning load” feature. Batteries Included…. This toy costs approximately £12.99 (for the latest and best prices make sure you check our retailer list for the CAT Preschool Lightning Load above). 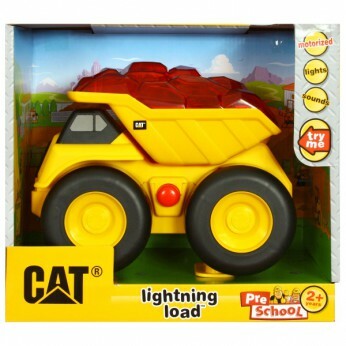 In our review of CAT Preschool Lightning Load we classed it as being suitable for ages 3 years, 4 years, 5 years but recommend you check the manufacturer specific advice before purchasing.